Who doesn’t like to gift a bottle of wine for a dinner party, house warming, Christmas or just because? 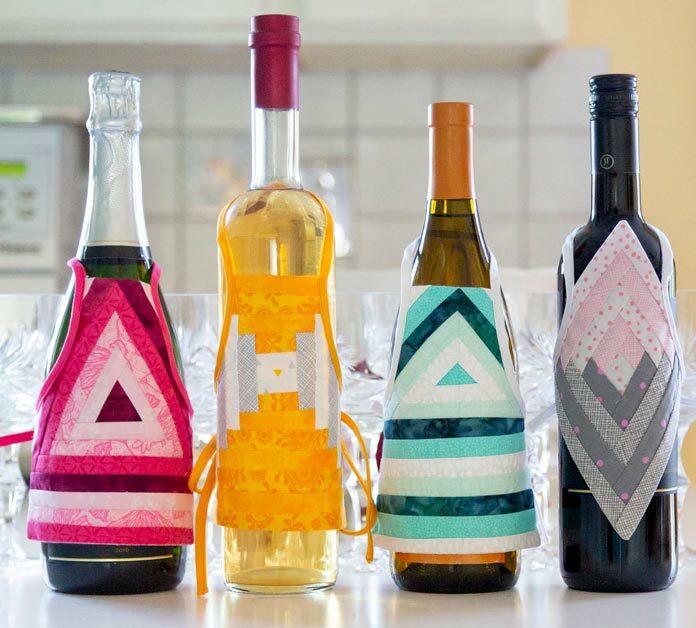 These fun decorative aprons allow you to use up scraps, practise quilting skills and dress up a wine bottle. Make the smaller size for a tree ornament or gift tag. Included are two pattern sizes, a wine bottle apron and a Christmas tree ornament. The Sew Easy Templates are a must for this project; they are available in six different shapes: square, diamond, hexagon, pentagon, triangle and right-angle triangle. Each set contains 8 different sizes, starting at ¾” finished size increasing in ¼” increments up to 4”. No need to gift wrap!